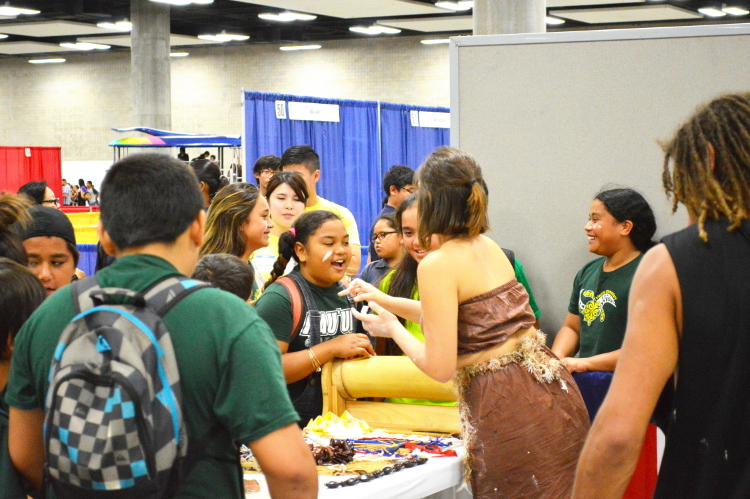 The Educational School Tour was held at the Hawaii Convention Center on March 6, 2015. 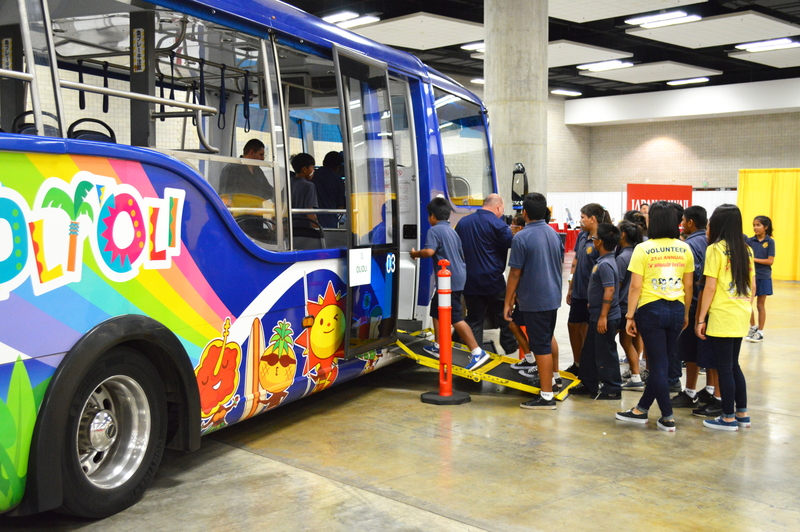 This is a tour for the local students to see the behind-the-scenes of our Honolulu Festival, where approximately 1,500 students from kindergarten through high school experience and learn various cultures. 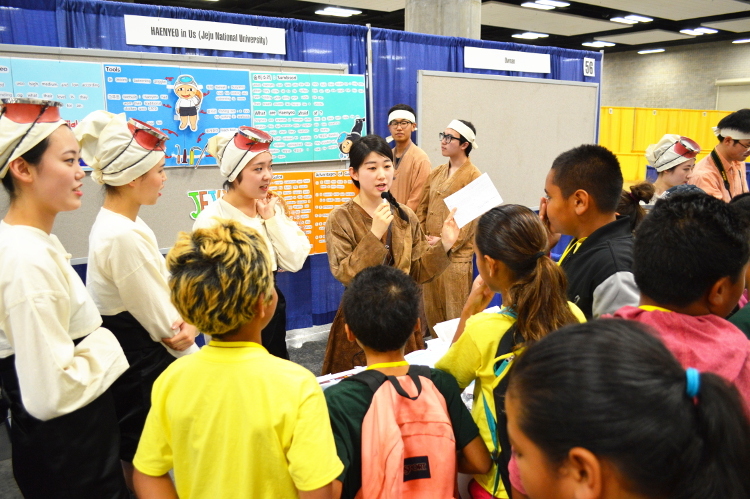 Also, it focuses on the field of “education”, which is one of the themes of the Honolulu Festival along with the “cultural exchange” and the “environment” for the next 20 years. 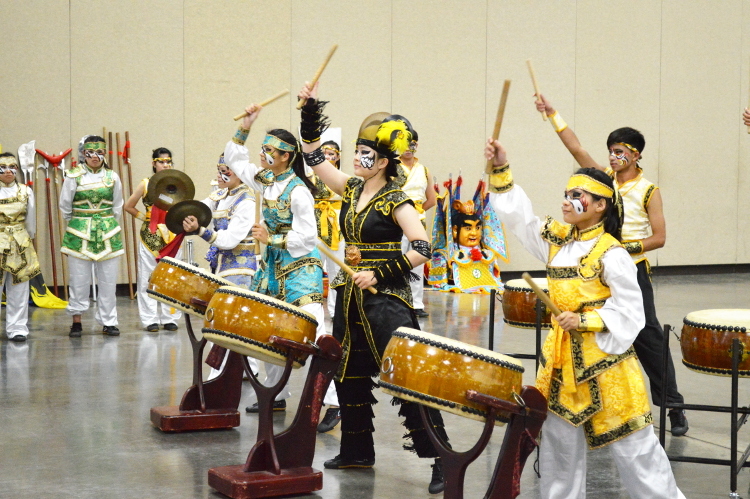 There were 20 performing groups from all over the world which they gathered to present their unique cultures toward the children and welcomed them. 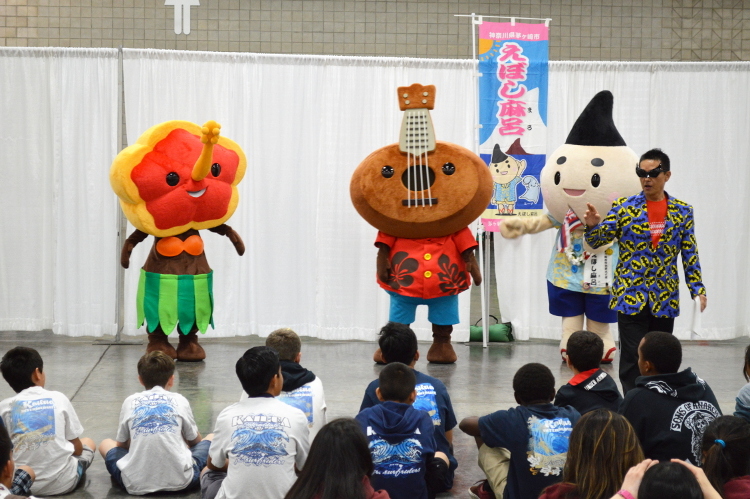 The “Japanese Mascot Characters”, “Child Book Reading”, “‘Oli ‘Oli Walker Riding Experience”, and “Polynesian Culture Center” were added as this year’s new programs at the Educational School Tour. 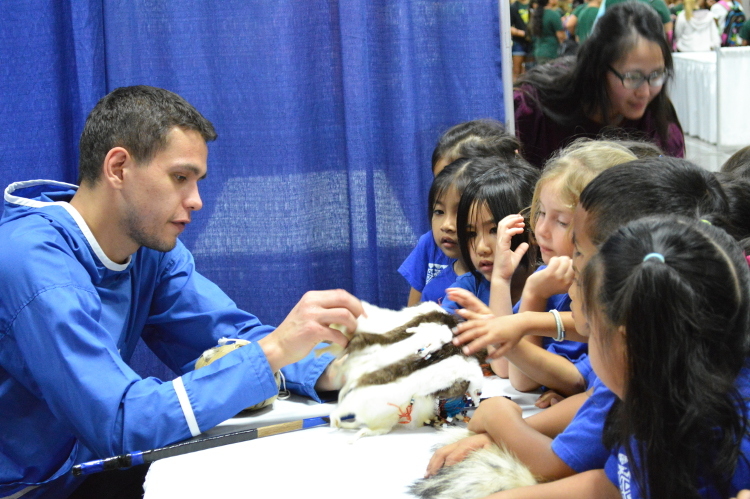 The children were formed into small groups and visited each booth with the assistance from our staff members and volunteers. The students and the children were intrigued to see a huge head of the “Daijayama”, which was displayed and prepared for the Grand Parade. The huge flaming Daija (huge snake) was brought from Omuta City, Fukuoka Prefecture. According to the Japanese folktale, Daija was the god of water that kept agricultural farmlands from drought and prevented the children from getting sick. 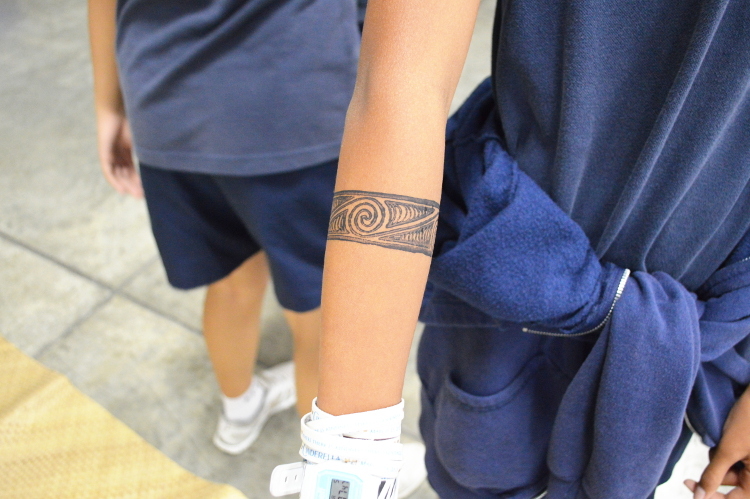 When the Daijayama’s cart passed through, the children shouted “Yoisa! Yoiyasa!” They even took pictures for each other’s despite of their little embarrassment while shouting out loud. 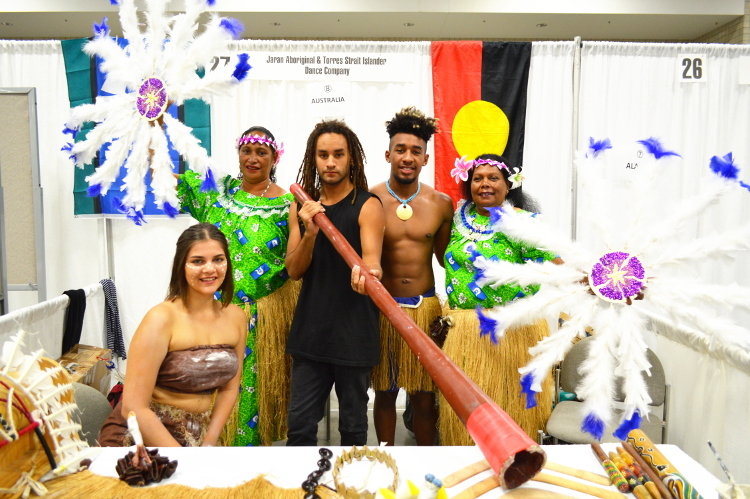 The unique musical instrument and face painting at the booth of the Jaran Aboriginal and Torres Strait Islander Dance Company had received a lot of attention. The children enjoyed having their face painted! 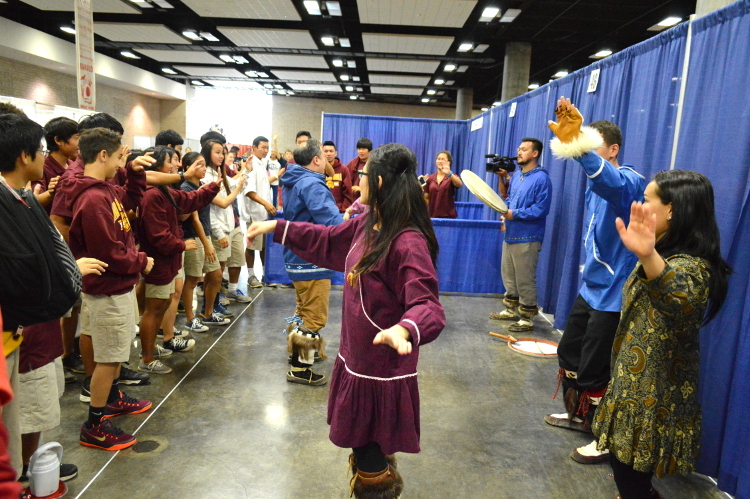 Also, the members from the Alaska Native Heritage Center Dancers wore traditional costume and fur boots and told the Alaska legends, stories and culture through Alaskan native dance. The children listened to the explanations of the meaning behind each musical instrument, cultural costume and face painting which they learned various aspects from different cultures. Furthermore, HAENYEO in Us, Jeju National University from Korea was dressed as a woman diver. 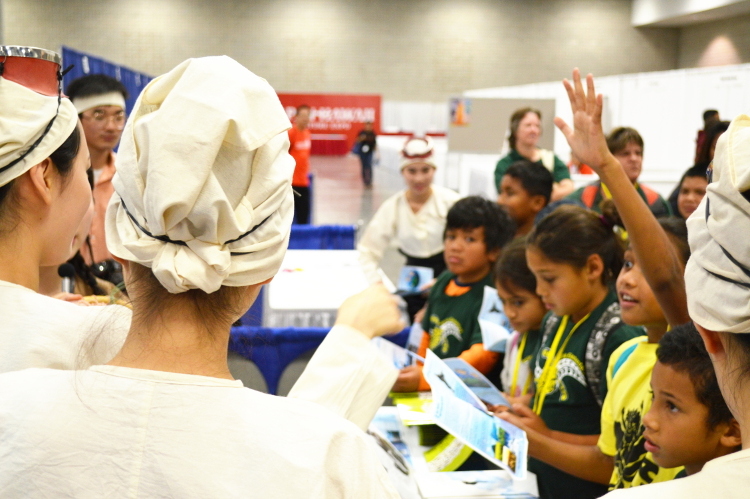 They introduced the diver tools in both English and Korean by using illustrations and quizzed the children. The children got excited when they received a famous tangerine chocolate from Jeju, which was a prize for the quiz. 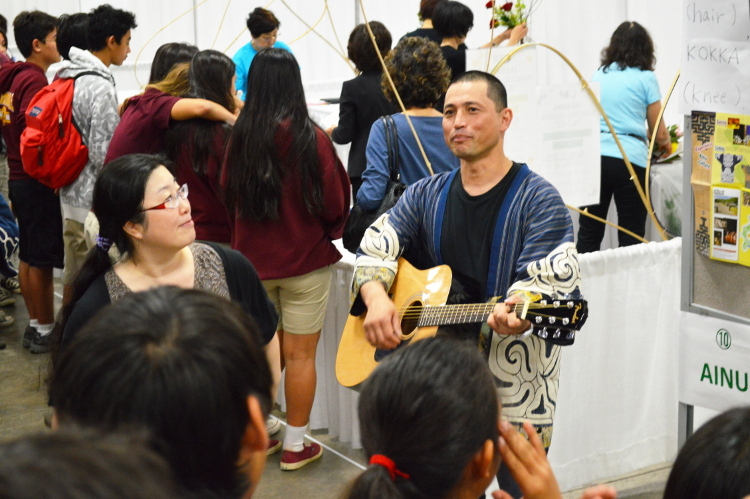 Also, there were cultural activities from Japan such as sado (tea ceremony), ikebana (flower arrangement), and wadaiko (Japanese drums). 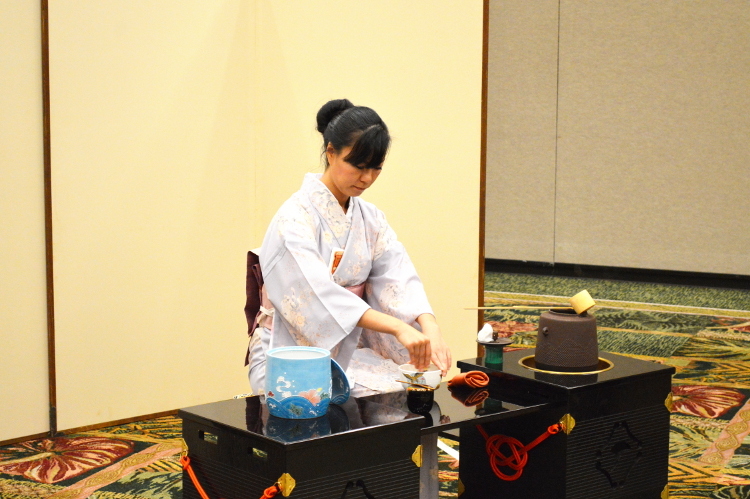 Moreover, the host dressed formally in a kimono and performed the Japanese tea ceremony. Meanwhile the children observed the preparation for the green tea. At the same time, they were a bit overwhelmed by its formality. 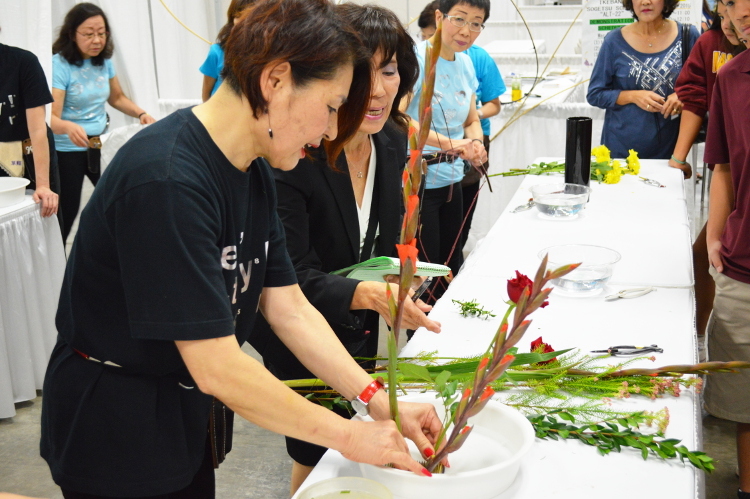 Normally, the Japanese ikebana is formal and inveterate. 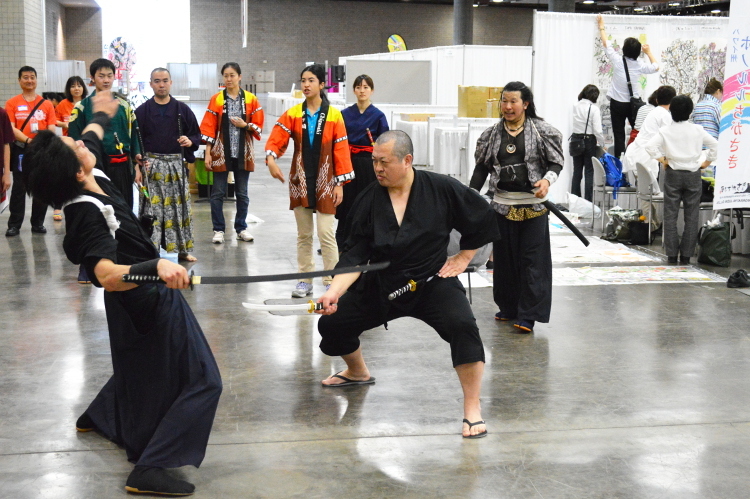 On the other hand, Sogetsu-ryu encourages uniqueness and freedom which is an unorthodox approach to its performance. This way, it is simpler for the children in learning the concept of “wa” or harmony. 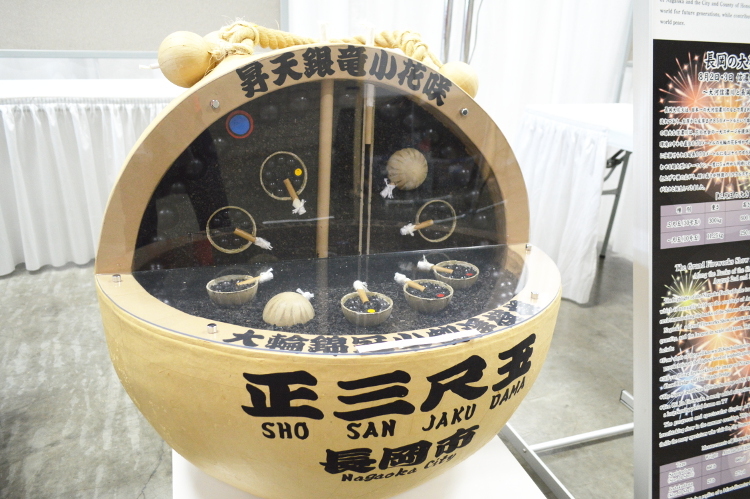 The taiko drum represents the static and dynamic part of the Japanese culture. 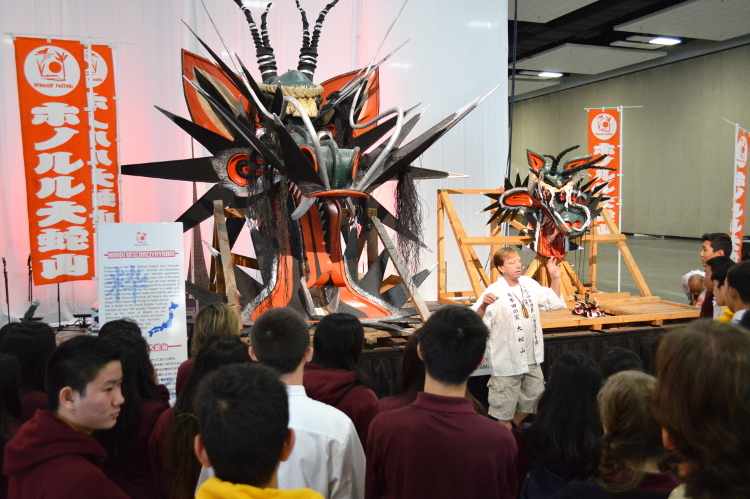 The children were excited to see and listen to the taiko drum. 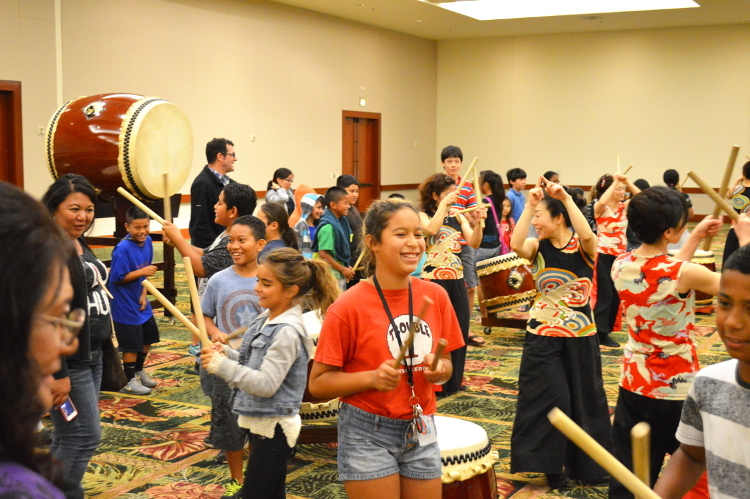 After a powerful performance by TAIKO KOZO, they picked up the drum sticks and experienced the instrument. In addition, its unique rhythms and movements made them delightful. 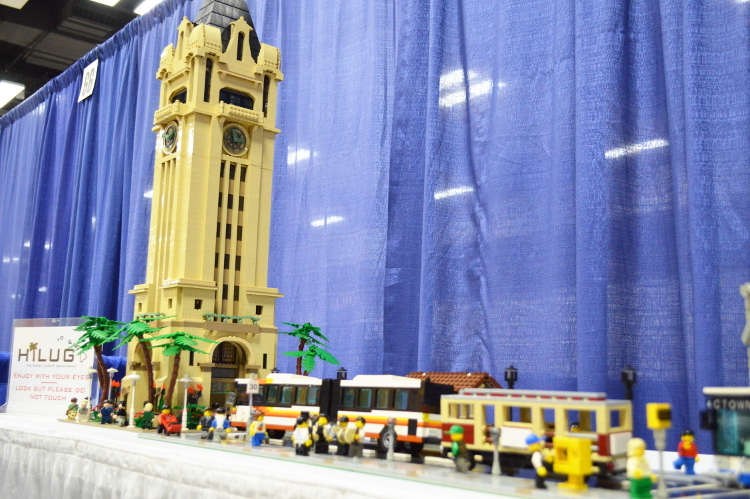 The Honolulu Festival continues to provide ample of opportunities for the children to experience and learn various cultures. We will continue with our annual Educational School Tour and keep contributing for the local children!